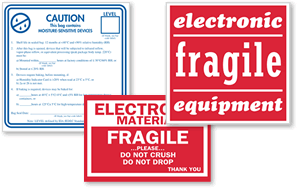 Electronic Equipment Labels help you mark fragile electronic devices during shipping. At as low as 2¢ each, you can quickly warn carriers of fragile, electronic equipment. Spend a little money on the front end to save yourself a lot of time, worry, and replacement costs in the long run. • Backed with an aggressive adhesive, made specifically for your shipping packages, like corrugated cartons, shrink wrap, plastic, or metal. • Available in a convenient roll pack of 500. • Choose any design you like from the selections below and compare details.